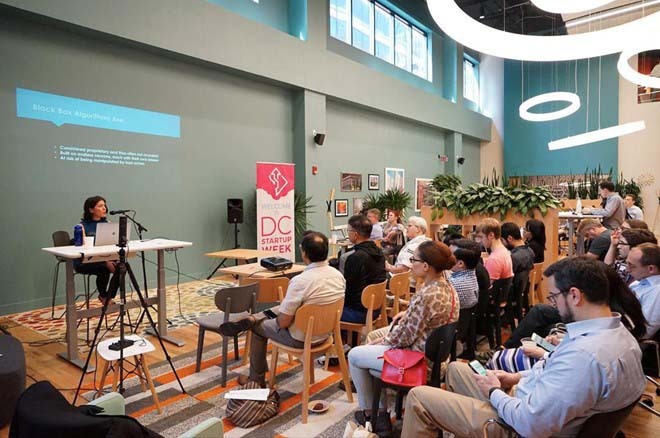 Last week, the Rosslyn location of SPACES hosted the third-annual DC Startup Week—the biggest DC Startup Week yet! More than 5,000 attendees from throughout the D.C. area took part in the five-day interactive event that showcased hundreds of regional startups, entrepreneurs, and the region's bustling ecosystem, helping to further foster growth within the local startup community. DC Startup Week participants networked and gained knowledge by attending thought-provoking, informative and entertaining panels, pitch competitions, hack-a-thons, exhibitions and discussions put on by more than 50 collaborating organizations, including D.C. Mayor Muriel Bowser’s office, several coworking places, startups, corporations, nonprofits and educational institutions. Overall, this exciting event included 120+ sessions with 220+ speakers in 33 locations across the city, Northern Virginia and Maryland. The week ended with a Pitch Competition. The winner was local startup TwentyTables, which won cash prizes from DC Startup Week and in kind prizes from its sponsors Google Cloud, GSP, SilverStrategy, Alley Powered by Verizon and Metamer Productions.